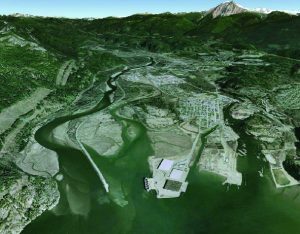 Two decades of revitalization efforts have returned large areas of the Squamish Estuary to a vital wildlife habitat and reversed the effects of human activity and industry. Yet the impact of industry and human intervention will be felt for a long time in this valuable aquatic area. Reviewer: Gary Williams, M.Sc., R.P.Bio, Professional Wetland Scientist, GL Williams and Associates Ltd. The Squamish Estuary is situated at the head of Howe Sound, one of the southernmost fjords in British Columbia, where the Squamish River drains over 3,650 square kilometers of coastal rainforest into the ocean. An estuary is formed when fresh water mixes with marine waters to create a brackish tidally influenced zone. Estuaries are one of the most productive ecosystems on the planet, providing habitat for fisheries, waterfowl, and wildlife. There have been many anthropomorphic impacts to the Squamish Estuary since it was settled first by First Nations and later by Europeans and other cultures. The impacts have included urbanization, diking and logging and resulted in loss of habitat, changes to hydrology, and introduction of contamination. 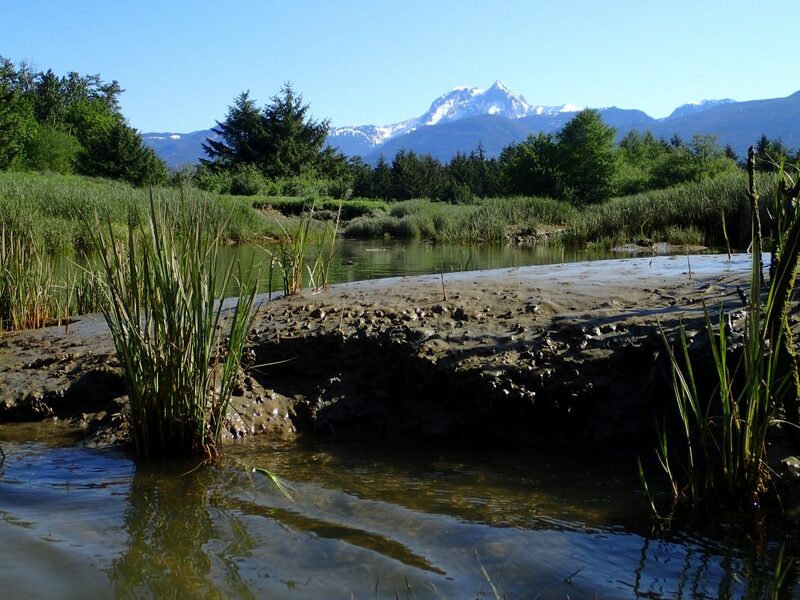 Organizations such as the Squamish River Watershed Society (SRWS) have been working for close to 20 years on re-establishing the estuary to its original function by reconnecting tidal channels, installing culverts, planting aquatic and terrestrial vegetation, and creating wildlife habitat for aquatic and terrestrial species. From 1999 to 2013 an area of over 15 hectares of brownfield (the former dredge spoils at the south end of the Training Dyke) were restored to functional estuary as well as the placement of 10 culverts along a three-kilometre section of the Training Dyke road. 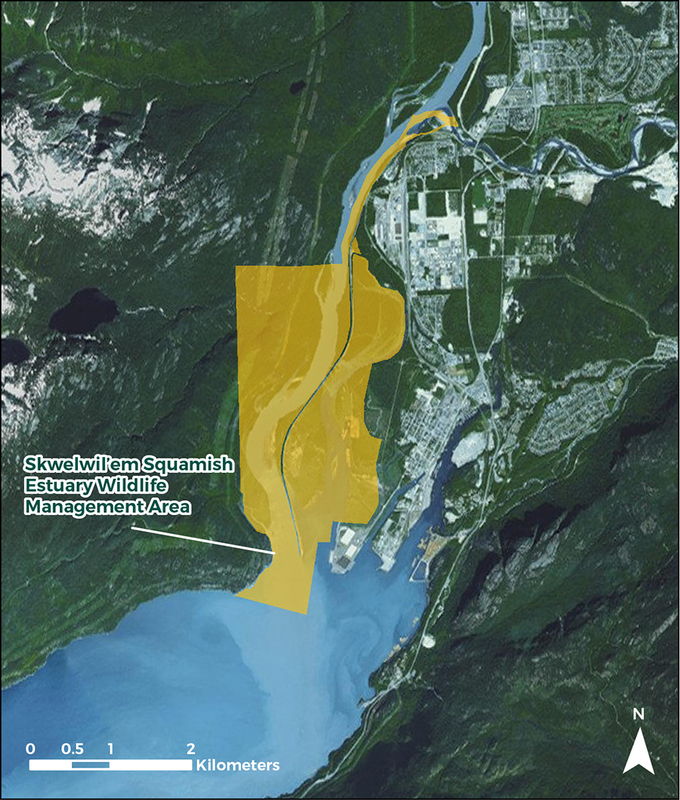 More recently, restoration of a major brownfield site in the central Squamish estuary got underway in 2015. The site was used as a log sort for many years and is located within the Skwelwil’em Wildlife Management Area (Figure 1). The goal is to re-establish tidal channels, mud flats and sedge marshes on the site. In 2015, efforts included removal of a large amount of wood waste, grading the site, and transplanting Lyngbye’s sedge (Carex lyngbyei), the dominant grassy plant in the estuary and in many Pacific coastal marshes. Figure 1. Skwelwil’em Wildlife Management Area protects much of the western side of the Squamish Estuary. The Squamish Estuary provides valuable habitat to fisheries including salmonids (Chinook, chum, pink, coho, steelhead salmon and rainbow trout) as well as herring and eulachon. 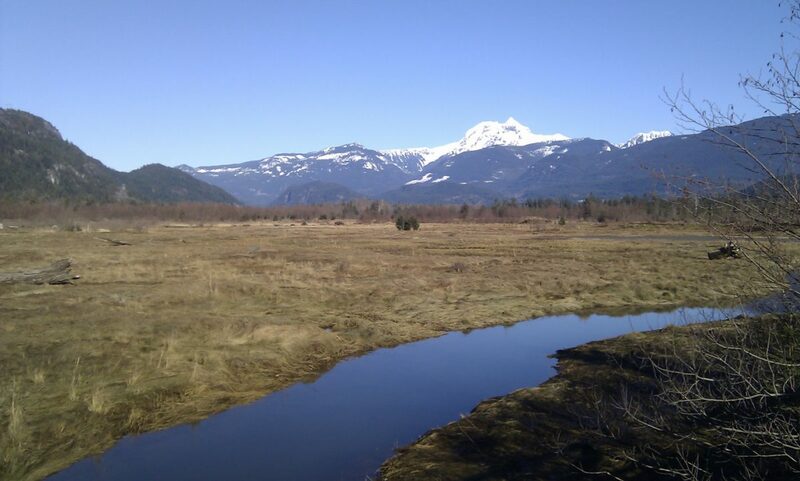 The Squamish Estuary is recognized as a Canadian Important Bird Area (IBA) and provides a home to numerous resident avian species including waterfowl and songbirds, as well as providing an important resting and feeding spot for migratory birds, such as the bald eagle and mountain blue bird. The monthly bird counts by organizations such as the Squamish Environment Society help to monitor and determine the overall health of the avian populations. 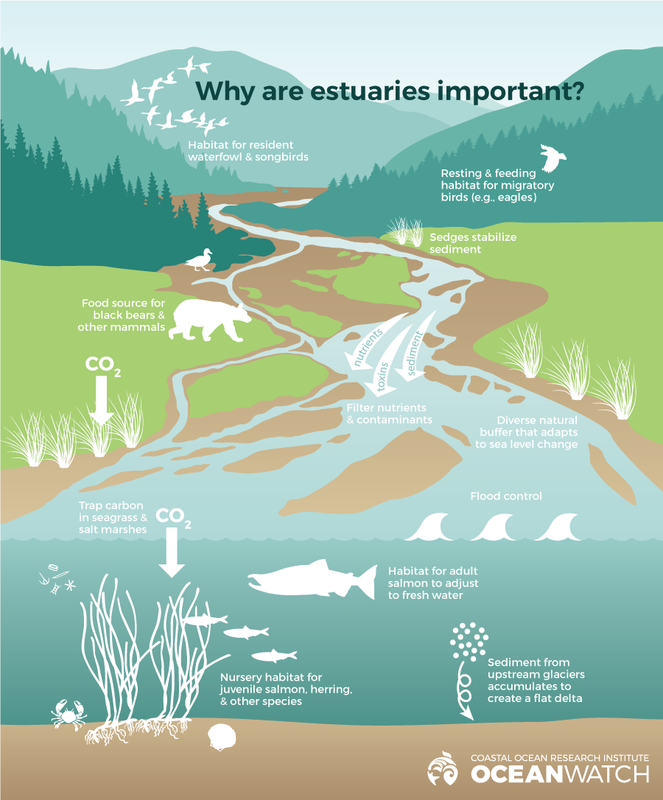 Estuaries provide numerous ecological functions that include critical flood control, filtering of contaminants, and providing a diverse natural buffer that adapts to sea level changes and helps to moderate against climate change. The Squamish River and its numerous tributaries originate in glacial mountain peaks and transport large volumes of sediment downstream that accumulate to create the flat delta of the estuary. Year by year, decade by decade, century by century the Squamish Estuary delta has advanced southwards into Howe Sound created by consecutive layers of silt, sediment and woody debris that forms the land base that we see today. These rich sediments and soils provide the basis for the vegetation growth in the estuary, in particular Lyngbye’s sedge, which stabilizes the ground and allows other plants to colonize and provide cover, habitat, and food that attracts diverse and rich wildlife. Furthermore, the Squamish River has a significant influence on Howe Sound, especially in the summer months when the freshet of glacial meltwaters containing fine talc-like sediments spills out into the Sound and creates the milky-green coloured water well south of Anvil Island and Porteau Cove. Ryder, J.L., J.K. Kenyon, D. Buffett, K. Moore, M. Ceh and K. Stipec. 2007. An integrated biophysical assessment of estuarine habitats in British Columbia to assist regional conservation planning. Delta BC: Canadian Wildlife Service Technical Report #476. Since 1999, about 20 hectares of the Squamish River estuary have been reclaimed from industrial use and restored to functional estuary. The landscape of the Squamish Estuary today is quite different from what it was historically with over 50 percent of the estuary now developed for part of the town site, roads, dykes, and industrial deep sea terminals. In the early 1900s much of the estuary was logged for the Sitka spruce, red cedar and other softwood lumber that was used in the ship building trade. Later, in the mid-1950s the remaining forests were logged for the pulp and paper industry, which was active in upper Howe Sound until the early 2000s. In the early 1950s, the first large deep sea port was constructed at the Squamish Terminals to ship pulp to the Asian markets. In the early 1970s, B.C. 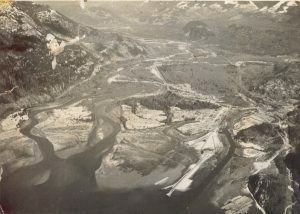 Rail intended to fill the western portion of the Squamish Estuary to create a coal port and constructed a large dike down the west side of the estuary to “train” the Squamish River to the western edge. In the 1970s, the government of the day shut-down coal port development, but the training dike remains in place to this day. From 2001 to 2010, organizations such as the SRWS have installed culverts through the training dike to once more allow the fresh water of the Squamish River to mix with the marine waters of the central estuary. As well as installing culverts, the SRWS has spent the past 15 years re-establishing tidal channels and estuary habitat (Figure 2). To date, the SRWS has helped to restore over 20 hectares of brownfield back into functional estuary and has built over 25,000 square meters of tidal channels in partnership with Fisheries and Oceans Canada staff. In 2008 the Province of B.C. established the Skwelwil’em Wildlife Management Area, which protects 673 hectares of the estuary. However, the remaining estuary outside of the Wildlife Management Area lacks the same level of protection and is under threat from new roads, loss of the habitat to marinas, logging, log booms, industry and urban expansion that have all but destroyed life in the subtidal zones (visual observations by Edith Tobe). Recently, partnerships between federal and provincial governments, stakeholders, volunteers and the Squamish Nation create positive benefits for the shared watershed environment. The Squamish Central Estuary Brownfield Restoration Project is a good example. Volunteer individually or as an organization with one of the local environment groups (i.e., Squamish Streamkeepers, Squamish Environment Society, Squamish River Watershed Society, or Squamish Climate Action Network) and learn about the estuary on a walk with any of these organizations. Report ecological information to local citizen science programs (see Citizen Science article). Increase educational and awareness campaigns that support widespread understanding of the importance of estuary health to all life in Howe Sound. Ensure accurate and comprehensive information is available and reviewed by area planners and decision makers. Continue to support and facilitate education, monitoring, and restoration activities of local groups in Howe Sound. Provide funding assistance and partnership opportunities where feasible. Explore the possibility of increasing the size of the Skwelwil’em Wildlife Management Area, or create more Wildlife Management Areas to increase protection throughout the estuary. Recognise the importance of estuary habitat for spawning and rearing salmon. Protect all estuary habitats from residential, commercial, or industrial development. Reclaim and rehabilitate estuary habitat that has been modified by past development.